It's not just carbon dioxide. What about volcanoes, solar variations, methane, aerosols and clouds? Ask the majority of climate scientists: Man-made carbon pollution is the cause of the global warming we’re seeing now. 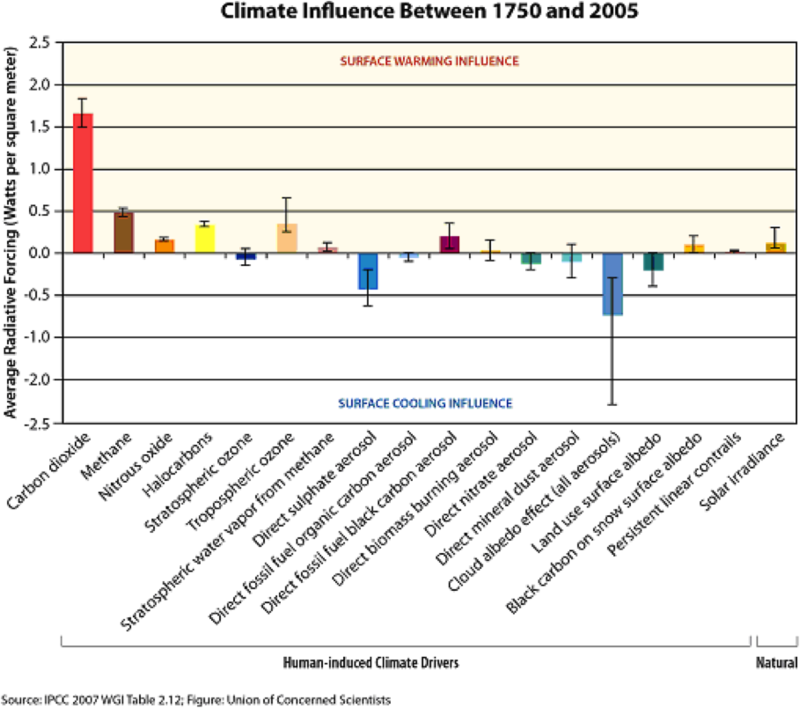 CO2, more than any other driver, has contributed the most to climate change between 1750 and 2005. The Intergovernmental Panel on Climate Change (IPCC) issued a global climate assessment in 2007 that compared the relative influence exerted by key heat-trapping gases, tiny particles known as aerosols, and land use change of human origin on our climate between 1750 and 2005. By measuring the abundance of heat-trapping gases in ice cores, the atmosphere, and other climate drivers along with models, the IPCC calculated the “radiative forcing” of each climate driver — in other words, the net increase (or decrease) in the amount of energy reaching Earth’s surface attributable to that climate driver. Positive values represent average surface warming and negative values represent average surface cooling. CO2 has the highest positive radiative forcing (Figure 1) of all the human-influenced climate drivers compared by the IPCC. Other gases have more potent heat-trapping ability per molecule than CO2 (e.g. methane), but are simply far less abundant in the atmosphere and being added more slowly.